After giving early access to Prime members a day before on January 19. The sale has now been opened for all members from today. Here’s we have listed down some of the best deals that are running on Amazon today. 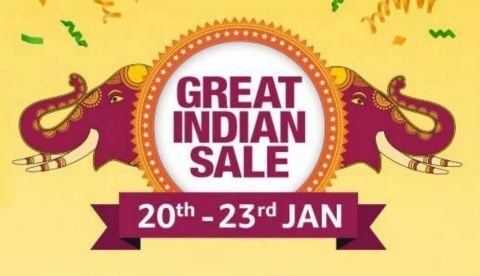 The Amazon Great Indian sale has kicked off yesterday for Prime members. Now, the sale is open for all and will run for three days till January 23. The e-commerce giant Amazon has also collaborated with HDFC bank and offering up to 10% discounts to those who will make payment through the bank’s card. So without adding further let’s just take a look at the deals. The Honor Play is powered by a Kirin 970 chipset and comes with a 16MP AI-powered selfie camera. The phone was launched with a price tag of Rs 21,990. Now, you can get this device for Rs 13,990 at the sale. Check out the product here. Amazon’s all-new Echo Dot 3rd Gen is now up for sale and available at a discounted price of Rs 2,999 down from its MRP of Rs 4,499. This smart speaker comes with a cloud-based assistant Alexa that can be controlled using voice command. Check out the deal here. The Samsung Galaxy Note 8 is now available on the sale for Rs 39,990. The phone was launched in India at an MRP of Rs 74,990. Check out the deal here. The TCL 55-inch 4K LED Smart TV offers a resolution of 3840 x 2160 pixels. The TV features a built-in Wi-Fi that allows you to access apps like Hotstar, Voot and more. This smart TV is available on the sale at a discounted price of Rs 43,990. Check out the deal here. The Amazon Fire TV Stick is a media streaming device that turns your dumb old TV into a smart one. The device is available on the sale at a discounted price of Rs 2,999 down from its launch price of Rs 3,999. Check out the deal here.